Although Chinese societies have generally become striking as the classic over-achievers in international measures of academic performance, there has been no specialised publication exploring early childhood curriculum in Chinese contexts. Through this book, readers will learn more about how the Chinese context and culture collide with educators’ beliefs about the right activities for children and educators in early childhood settings. 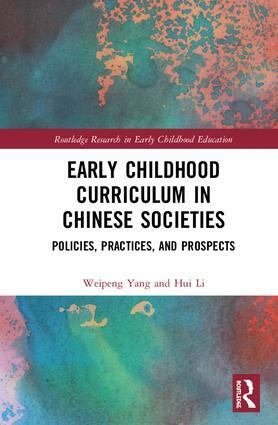 This book will be the first one of its kind to focus on early childhood curriculum in Chinese societies – from social context and culture to reforms and practices, and finally to the lessons that researchers, policymakers and practitioners could learn, as well as future directions. Is play valued? Are young children schooled earlier in Chinese societies? How do Chinese children learn in kindergartens? What is valued by Chinese educators when they implement early childhood curricula? How do Chinese teachers deliver early childhood curricula for their young children? Why were Chinese early childhood curricula implemented in these ways? Answers to these questions and more will be provided in this pioneering book. Weipeng Yang, PhD, is a Lecturer in the S R Nathan School of Human Development at the Singapore University of Social Sciences. His research focuses on exploring the theoretical and empirical underpinnings of early childhood curriculum innovations. He has published in Journal of Curriculum Studies, Early Education and Development, Computers and Education and other journals. He is currently the editorial board member of Early Education and Development. Hui Li, PhD, is the Professor in Early Childhood at Macquarie University in Sydney, Australia. His research interests lie in developmental psycholinguistics, early Chinese literacy, early childhood curriculum and pedagogy, and educational policy. He has published more than 180 academic works including books, book chapters, and journal and conference papers. His early childhood curricula and pedagogies, Story Approach to Integrated Learning (SAIL) and Story-based Project Approach (SPA), are widely used in Chinese societies. Since 2011, he established the Early Child Mandarin Corpus (Beijing & Singapore) and Early Child Cantonese Corpus (Hong Kong). He is the co-editor of the Journal of Research in Childhood Education, the associate editor of Early Education and Development, and the editorial board member of three international research journals in the field of early child development and education.